Our technology-based solution produces tangible results through each step of construction utilizing integrated virtual design and construction (VDC) tools. 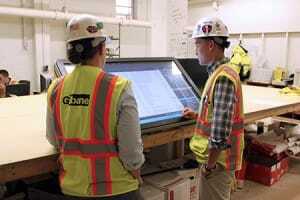 Gilbane’s VDC process is a technology-based solution that takes the next steps to ensure that the model is used in a practical and highly effective manner throughout the lifespan of your project. Using BIM, we create a model that shows visualizations, logistics planning, constructability analysis, clash detection and more. These visualizations allow the project team to communicate design intent in 3D instead of a flat 2D plan. Real time walk-throughs and simulations can realistically convey the look and feel of the new facility before a shovel ever hits the ground.